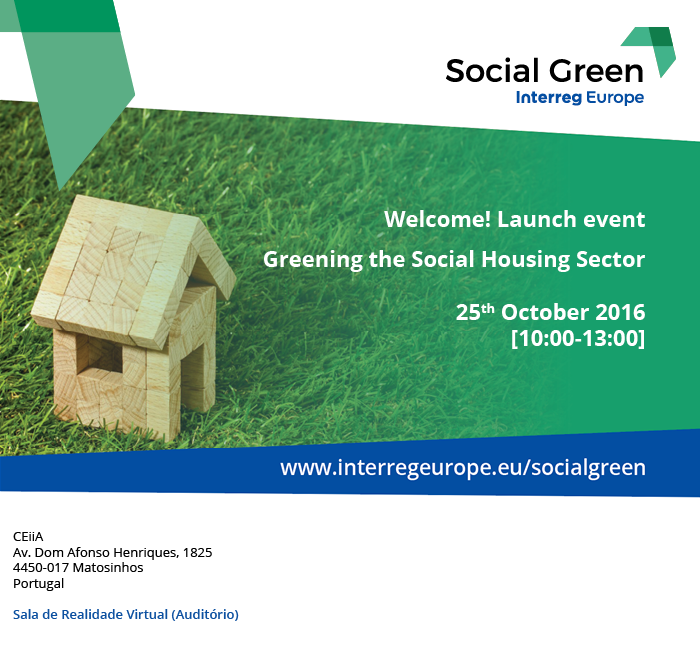 Welcome to the Regional Policies towards Greening the Social Housing Sector launch meeting in Portugal 25 October 10:00-13:00. The launch is organized back to back with the project kick-off meeting, including study visit and political board 25-27 October. The Social Green project intends to address the issue of green social housing in order to contribute to reduce the GHG emissions as well as to reduce the fuel poverty indicators in EU regions towards a lower carbon economy. In more concrete terms, Social Green aims promote the greening of the social housing sector through mutual learning and development of improved regional policies. It will provide the opportunity to explore green building practices and significantly reduce GHG emissions through cost-effective means while providing much needed housing in a healthy and sustainable manner. Through interregional cooperation Social Green stakeholder regions will identify, share and transfer innovative methodologies, processes and good practices in developing and implementing greener social housing sector policies, targeting new constructions or retrofitting existing buildings. The partnership includes 8 partners from 6 countries (Portugal, Spain, Croacia, Estonia, Sweden, Romania), with capacity to influence the policy instruments related to greening the social housing sector. Nordregio will be lead partner as well as advisory partner by providing scientific and technical support to the consortium. The other partners, mainly municipalities, energy agencies and Managing Authorities will jointly work in the development of the main project’s activities, mainly to develop a produce regional self-assessment reports and regional action plans.